Hattie Briggs is a singer/songwriter. Brought up on the mellow strains of James Taylor and Eva Cassidy she's been singing for as long as she can remember. Having taken guitar lessons at school, she started to teach herself the basics of piano at 17 and was surprised when she sat down at the keys one day to find her first song "Without a Smile" forming itself within the space of an hour. She has been writing and recording new material since then and released her debut EP, "My Shepherd's Hut" in November 2013. This has now received various very favourable reviews which you can read below. Hattie is a natural and sensitive performer with a unique, unaffectedly expressive voice and style. Her songs are crafted with a maturity that belies her twenty one years, and an honesty that when combined with her presence on stage will win over the hearts of any audience. She is now gigging regularly all over the South of England from London to Oxford, Bristol to Cheltenham, in West Sussex, Dorset and Hampshire. Forthcoming gigs are all listed on her events page and vary from festivals to intimate club performances, and from busking to playing at weddings and private parties. Hattie has received a lot of airplay over the last few months, including Mark Forrest's BBC Introducing show that is broadcast over 39 counties. She is also currently featured on the playlist of BBC Radio Gloucester which covers Gloucestershire, Somerset, Wiltshire as well as the Bristol area, and on the new station, Severn FM Radio. She played live on BBC1 Points West Television earlier this year and was interviewed and featured on the Simon Mayo DriveTime show on 19th February playing "Pull Me Down" live from the Green Room at the Albert Hall. You can click here to go to Hattie's Facebook page and follow her on Twitter, @HattieBriggs. Click here for details of Hattie's musicians and production team. What a year Hattie Briggs is having! Highlights include a debut EP - 'My Shepherds Hut' - loved by all those who've listened to it, and the 'Pull Me Down' single - a gorgeous song that went top 20 on the iTunes singer songwriter chart. 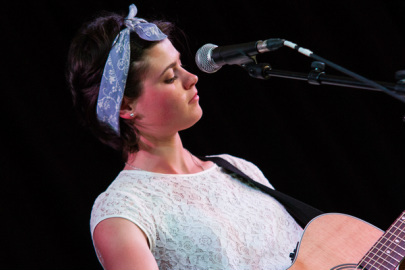 Hattie narrowly missed out on winning the Radio 2 folk award - but performed live on Radio 2 anyway and also recently playing not once but twice at 'The Cambridge Folk Festival'! Not a bad 12 months then! These being just a few select highlights. Watching Hattie's adventure in song is like watching a flower unfolding to reveal it's true beauty. With a new single and album on the way, it feels like the best is yet to come! Hattie has much to say - and say it she does in a natural setting. Hattie's recordings and live performances never sound forced or rushed... organic and natural would be the best way to describe the music she makes. As a big fan of the singer-songwriter genre and someone who listens to lots of music, it's refreshing to hear songs and performances that don't adhere to fashion or hype, but move you because of conviction and purity. I for one cant wait to see where Hattie's journey will take her next. Alex Huskisson - The Mystery Train Radio Show - Severn FM, August 2014. "Pull Me Down" and"My Shepherd's Hut"
“Pull Me Down” is a new, rich lyrical song from the vast reservoir of talent of Hattie Briggs, whose outstanding performance on BBC Radio at the interval of the Young Folk Awards showed why she is among Britain’s rising folk music stars. This piece, perhaps the most sophisticated yet in terms of production quality, does what Briggs does so well: take the personal and make it universal. It is, after all, hard to hear the song and not consider how much it springs from the life of a 20-year-old singer who is on the cusp of vast change as more British and American listeners experience her music. As with anyone who has ever been surrounded by new people with very different expectations of what one should do with one’s life, Briggs notes that “in you they say they found where they’re going.” Yet there is a wry voice of wisdom asking, “if you were me would you take yourself so seriously?” The answer, in this wistful ballad, is no. Life may change; the roll of the dice may be good or bad; but the person within will not be tarnished and polluted by everything going on around her. That’s a powerful message, delivered as always in Briggs’ emotive, multi-faceted voice through the rich imagery that distinguishes her work. It’s also a universal message – whether to the singer on the brink of fame or the executive on the brink of corporate power. The singer in “Pull Me Down” wants to be true to who she is inside, regardless of what happens on the outside. That message, and the contemplative way it is delivered, makes “Pull Me Down” one of Hattie Briggs’ finest efforts as she makes her mark as not only an outstanding singer, but as a lyricist with something worth hearing. Hattie Briggs is a Rising Folk Music Star by Rusted Wolf Click here: https://itunes.apple.com/us/album/my-shepherds-hut-ep/id766914311. The essence of outstanding folk music is the ability of the artist to take the tradition of the genre and personalize it so that the resulting mixture is something that is comfortable in its familiarity while also new in its unique treatment of timeless topics. To say that Hattie Briggs succeeds in “My Shepherd’s Hut” understates the achievement of an outstanding lyricist and vocalist. Her writing is direct and honest; her voice is nuanced to reflect each emotion she shares, from a worldly-wise wistfulness that belies her 20 years to a playful optimism that for lovers somewhere, somehow, there will be a better place. The five songs that make up the ‘My Shepherd’s Hut” EP revolve around the central theme of relationships. “Just You and I” and “Where Your Love Should Be” are universal. Either can as easy be the theme song for a troubled couple in an Amarillo, Texas, bar with sawdust on the floor or a pair of black-leather-clad teenagers grasping for something more on the wet, windswept streets along the North Sea. “Tilly’s Song” is lyrically simple, but melodically beguiling. It is a mind-escape song that you hear on the drive to work or school and – hours later – it’s still there to take your thoughts outside to a happier place while the boss or prof spews endless hot air. In the repetition of the simplicity and the imagery of summers of memories, Briggs creates that shared image of wistful nostalgia for something lost in the past while affirming that bonds between friends never fully shred with the miles and the years. “Without a Trace” shakes up the simpler melodic pattern of the other pieces as two lovers challenge fate. They are mysterious and enigmatic figures. Briggs plays with lyrical expectations as she has the female character say, “I’m only young but there’s lines on my face” before telling us that after her escape to a “better place,” “young or old there’s no lines on her face.” Knowing there is only one place that is not in this world where lines are washed away makes us wonder where the lovers went. It is that enigmatic sense and the different rhythms that make the song a sort of impressionist puzzle as well as a youthful declaration of escape. “Still With Hope I See” is representative of her more introspective pieces with spare piano chords and lyrics that distill the marrow of human experience. The refrain, “when I look at you with wounded eyes / it’s still with hope I see” coupled with Briggs’ strong vocals takes a song nominally about relationships into another realm. It is not, after all, only lovers who experience this – so do families on any one of a thousand days, the dreamer confronting his dream; or anyone confronting the image in the mirror. Briggs is not talking about someone else; this is music at its most universal and also personal. The darker mood is not a hopeless one. For despite the wounds retold and the emotional scars visible in the words, the piece retains a redemptive note. Not false hope, but hope that endures despite logic. “My Shepherd’s Hut” is an outstanding debut. The powerful language of Hattie Briggs’ songs and her perceptive imagery demonstrates her outstanding potential to becoming a truly great lyricist. Her lively voice imbues those words with added depth, and makes listening to her music not an affair for the ears, but one for the heart. The richness of her work makes Hattie Briggs a noteworthy addition to the folk music world. ALEX HUSKISSON REVIEWS "My Shepherd's Hut"
Hattie Briggs debut collection of songs 'My Shepherds Hut' is about to be released. I first saw Hattie perform in Stroud during the Fringe festival and it was a captivating intimate performance - much like the sound on this - Hattie's first EP. "Share Your Heart" was the track that instantly got to me....it questions 'love' in a non mawkish way - beautifully played - and recorded live! No studio trickery - just gorgeous piano and vocals to the fore. 'Still with Hope I See' follows, again piano takes centre stage - a sadness is expressed, but hope is sought. 'Tilly's song" looks back and celebrates friendship and 'Where Your Love Should Be', like Tilly's song - is mainly acoustic guitar driven - sweet in sound - again Henry Fraser providing subtle backing vocals - it's bluesy refrain 'Cause I need your love etc.....' adds a different dimension to the track. The EP is rounded off with a cut called "Without A Trace" ... an upbeat 'story telling' style of song - that talks about heading to 'a better place'. For a first EP "My Shepherds Hut" sounds remarkably assured - songs of quality played without fuss - natural and unforced. It promises much and comes highly recommended. Alex Huskisson - Stroud FM, October 2013.